Explanation: The two bright meteors flashing through this night skyscape from August 7 are part of the ongoing Perseid meteor shower. In the direction indicated by both colorful streaks, the shower's radiant in the eponymous constellation Perseus is at the upper right. North star Polaris, near the center of all the short, arcing star trails is at the upper left. But also named for its pose against the sky, the monastery built on the daunting sandstone cliffs in the foreground is part of Meteora. 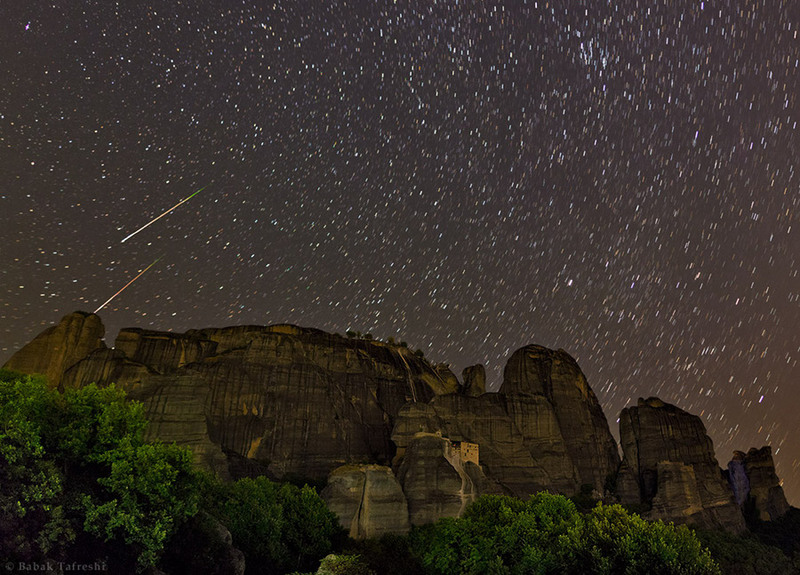 A World Heritage site, Meteora is a historic complex of lofty monasteries located near Kalabaka in central Greece.